Home > Recent > Are Synthetic Meats as Likely to cause Food Poisoning as Natural Varieties? In 2013, the world’s first lab-grown burger was plucked from a scientific institute in the Netherlands and shipped to a special news conference in London, where it was cooked, shared and savoured by a panel of food critics. The verdict: it was actually quite nice, tasting somewhat like real meat, albeit drier. Now, following the success of the prototype patty (which itself grew from an existing mass-market for lower-quality faux-meat products), its generative team of scientists have set a target of 2020 by which to reach a stage at which lab-grown meat is available at higher quality and lower price (the 2013 project having cost £215,000 for just one burger). In short, the future of synthetic meats (also known as artificial, cultured, clean or in-vitro meats), looks very bright indeed. However, we should ask whether all this forward-thinking progress is actually doing us more bad than good. Specifically: how safe are artificial meats compared to their naturally-occurring cousins? To begin, we should break-down a misconception: you can indeed get the same types of food poisoning from artificial meat products as you can from their natural counterparts. The difference, however, is that you’re far less likely to get food poisoning from the faux variety. The same is true of salmonella: which naturally occurs in animal intestines. The problem is the sheer amount of faecal matter in which chickens tend to live (especially in battery farms). That, ultimately, is the reason why raw chicken is so dangerous to eat. By taking the general filth and unhygienic slaughter conditions out of the equation, therefore, synthetic meats are less likely to give you food poisoning. Nonetheless, the risk is certainly not zero. Firstly, we have to remember: cross-contamination is always a possibility with food pathogens: Quorn is a popular brand-name producer of high-protein imitation meats, including chicken, mince and sausages. If you drop a Quorn burger on the floor, it’s made unsafe; cut it with the same knife you used to cut raw chicken, and it’s dangerous. Secondly, however: certain faux-meats can have their own unique ways of poisoning you. Quorn, specifically, is made by the fermentation of a certain fungus in a vat; and can be dangerous in so far as certain people are badly allergic to its fungal ingredient. Over 2,000 people have reported nausea, cramps and diarrhoea after eating Quorn, and two people are said to have died. Still, other artificial meats don’t necessarily carry the same risk. 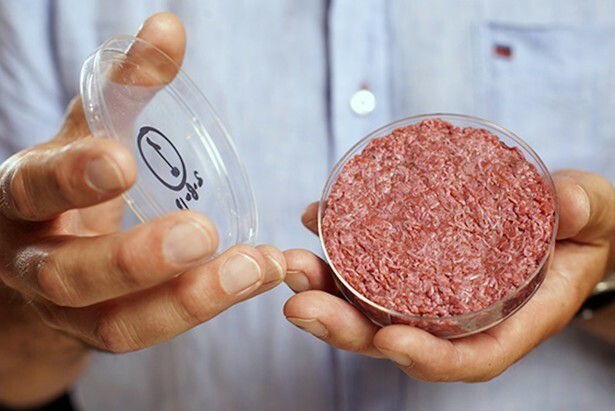 The 2013 prototype patty, for example, was made with layer upon layer of actual meat, grown from stem-cells taken from a cow (without the need to slaughter the animal). So, awareness of the ingredients of imitation meat can be very important when determining whether it’s more dangerous than naturally-occurring varieties. In sum, therefore, there’s no simple answer to the question of whether or not synthetic meats are more likely to give you food poisoning than natural varieties. On balance, it seems the risk is lower, mainly thanks to their more sterile surroundings from producer to plate; however, it’s also worth knowing the ingredients of such products before you buy, just in case. That said, such problems as those which Quorn has thus far encountered seem to be less likely to recur in the future, what with the advent of clean, ethical, lab-grown meats made from stem cell harvesting rather than battery or backyard farming.